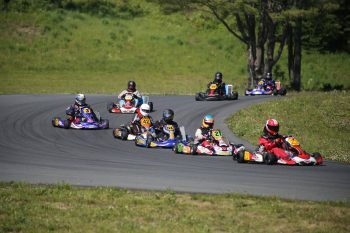 After a hugely successful two-race stint at Canaan Motor Club, the NHKA Racing Series will be carrying tons of momentum into the tight turns and high banks of the NHMS Hill Course. Aside from the record-breaking number of entries, the most impressive aspect of the season so far is the uniformly high level of skill demonstrated by both drivers and mechanics. This was clear from how everyone was ready and on the grid on time and how few breakdowns there were. It was also seen in the infrequency of off-track excursions and contact, especially given how incredibly tight the racing was from green to checkers. In the end, everyone enjoyed their fair share of track time and fun. The championship standings after Race 3 can be viewed by clicking here. This coming Saturday is Race 4 of the NHKA Racing Series. Thank you to everyone who has already entered. The headcount is promising and the forecast can’t be beat. Trophies will be sponsored by long-time karting supporter Earthwork Industries. Owned by TaG racer Derek Franklin, the company provides complete environmental remediation services throughout the Northeast. Their expertise includes wetland restoration, contaminated soil removal, remediation systems, drainage, sewer and water connections, commercial and residential septic systems (including MA Title 5), and more. Please thank Derek when you see him, and call 508.643.4430 for Earthwork Industries – they move earth to make big projects heaven. « Are You Ready for Another Dose of Canaan Motor Club?